Hope everyone enjoyed the blog hop last week, the winner has been announced over on the Cowgirl Sunday Stamp'en Challenge blog, hop over and see if it is you. This week we would like to see your cards over the top with BLING BLING and we have NEW RELEASES from CJ at Cowgirl Up Designs, all the new images have a fall theme. There will be a discount on the new releases for more details hop over to the challenge. My image is called FALL AFTERNOON. It was a pleasure to colour and I really enjoyed colouring all the leaves in Autumn colours. I used a cream base, coloured with Promarkers and Copics added bling with my gold Sakura Calligraphy pen, and gelly roll pen. 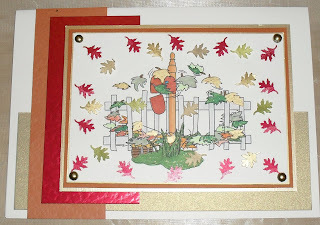 I then punched leaves out to form a border which I backed with shiny red paper and after all that effort you can't really see any of it on the photo. The punched out leaves were coloured with gold pen and distressed ink and 3D randomly on the image. I used the sketch from Friday Sketchers #126. To see what the other Posse members have been upto go to the buttons at the top of my page and click it will give you the links or you could hop over to the Challenge and see all the Posses fantastic creations. 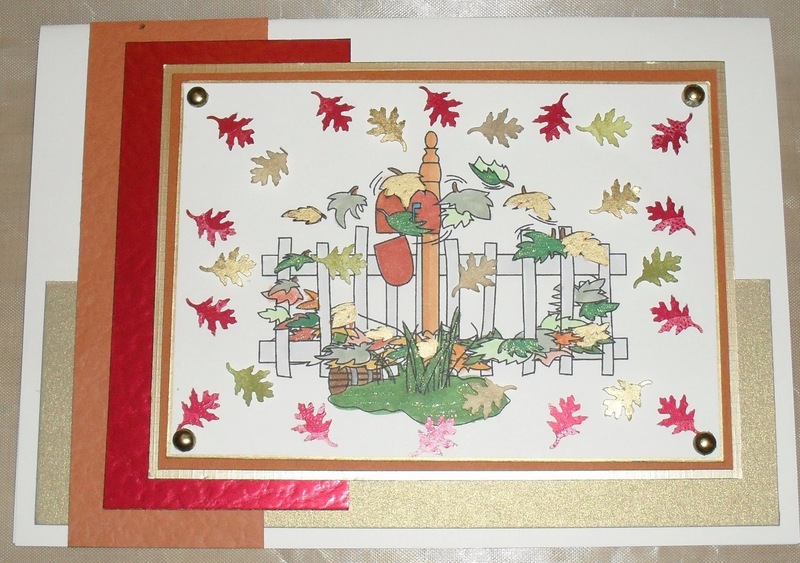 Hi hunni this card is fabberlicious I love Autumn colours they are my fave, I love all the browns & terracotta's....the colours on here are fab I love all the leaves & your sparkly card. Hope you are having a fab weekend hun, take care. Thanks for joining us at Crafty Creations Challenge! Good luck! Thanks so much for joining us at Friday Sketchers!